It’s often thought that when it comes to gastronomy, France seems doomed to occupy the hinterland of nostalgia. However, there are still those capable of thrusting it forward into modernity. 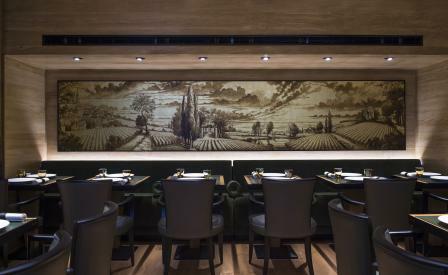 The Taillevent group – behind the brilliant two-Michelin starred Le Taillevent – have exercised good taste by opening a sister restaurant to its fine Parisian brasserie, this time located in London’s Cavendish Square. Occupying a Grade-II listed Georgian building completed in 1731 by architect Edward Shepherd, the interior has been given an alluring makeover by legendary designer Pierre-Yves Rochon to evoke the restaurant’s viniculture leanings and the space’s former life as a banking hall. Stained natural oak and wrought iron evoke wine casks, while leather banquettes and velvet curtains are stained the same green hue as vintage Pétrus bottles. Guests can gaze at the 110 wines (all available by the glass) displayed proudly and stacked to the ceiling as they tuck into a menu of updated Gallic classics – the sweetbread vol-au-vent is on track to become a cult classic among Francophiles, while the emmental and ham mac and cheese rivals the best in the city.